A hormone produced in the pancreas by the islets of Langerhans, which regulates the amount of glucose (type of sugar) in the blood. Foods that are assigned a value on The glycemic index according to how fast or slow a food cause blood glucose levels (blood sugar levels) to rise. For a more indepth look at High Glycemic foods click here from Harvard Medical School. Why in this Case is Inflammation bad? I am going to talk about chronic inflammation. Chronic inflammation is perstistant low level inflammation that never stops. The body perceives a threat when there isn’t one sending white blood cells to swarm but have nothing to do and nowhere to go, and they may eventually start attacking internal organs or other healthy tissues and cells. It can lead to muscle loss, and certain diseases such as Alzheimer’s, arthritis, cancer, diabetes, and heart disease. As well as causing glycation of the skin. What is Glycation? How Does it Affect Skin? Glycation is when sugar molecules attach to fat and protein (such as collagen) molecules making those molecules ridge. Causing collagen a protein to become inflexible making elastin in your skin less elastic. Collagen and elastin keep your skin firm and wrinkle free. With the loss of collagen and elastin, which as we age do lose over time but is exacerbated by inflammation causes sagging skin, wrinkles, acne and Rosacea. Glycation also causes, free radical formation and oxidative stress. Free radicals can damage the skin by trying to grab an extra electron from atoms in the skin. When atoms are taken away from molecules in the skin, it causes damage to our skin’s DNA that increases skins aging. Again causing loss of collagen and elastin as well as causing pigmentation to the skin in spot as well as broken blood vessels. While oxidative stress is when in the balance between the production free radicals and other bodies antioxidant defenses are exacerbated. Oxidative stress causes the skin to lose collagen and elastin as well as causing skin pigmentation. Following a healthy diet by a dietician or doctor that is has less sugar and low glycemic food will help not only your skin but your entire body and your aging process..
Eat for Beauty and Health from the Inside out! Delicious and Beautifying Summer Drink Recipes! During the summer, it’s especially important to stay hydrated for optimal health and beauty. Your body will crave more fluids as you are naturally perspiring more. Sometimes I feel like a camel in the summer, and just guzzle away many times more the amount of fluids than I do in the winter. While pure water is always best, sometimes you want a little flavor in your refreshment. Unfortunately, many popular summer drinks are filled with sugar and chemicals that do you no favors in terms of your health or hydration. But there are many other good choices, and you can enjoy a refreshing summer beverage without all of the chemicals and sugar. Here are five of my favorites. If you follow the Beauty Detox program, you religiously start each morning with hot water with lemon, and perhaps drink more lemon water throughout the day. This is a different twist on our daily citrus-flavored water. Cucumber is a powerful beauty food, and this refreshing beverage infuses water with the flavor of cucumber. Cucumbers are high in vitamins A, C, and B6, as well as folic acid. Best, the drink is super easy to make and really delicious! Combine cucumber and water in a large pitcher and allow to sit for one hour or longer. Serve cool. Place fruit and water in a blender and puree. Place a small sieve over a pitcher and pour mixture into it, straining the liquid into the pitcher. Discard solids. Add lime juice and stevia. Lemons are high in vitamin C and promote alkalinity and cleansing in the body. The basil adds a refreshing flavor to this sugar-free lemonade. Place basil in the bottom of a pitcher and muddle it by slightly crushing the leaves. Combine lemon juice and water and pour over basil leaves. Add stevia to taste. Chill, and serve over ice. Drink 30 minutes before or 60 minutes after you eat so you don’t dilute your gastric juices necessary for food digestion. Avoid electrolyte replacement beverages, soft drinks, and other sugary drinks filled with chemicals. Just avoid them all. When you are active, be sure to take plenty of pure water with you. Drink mostly water, and have special drinks like those listed above occasionally when you feel that you need something with some flavor. Coconut water is also a good option. The Institute of Medicine suggests letting thirst be your guide to summer hydration. There’s no need to force beverages. How can you tell if you are dehydrated? 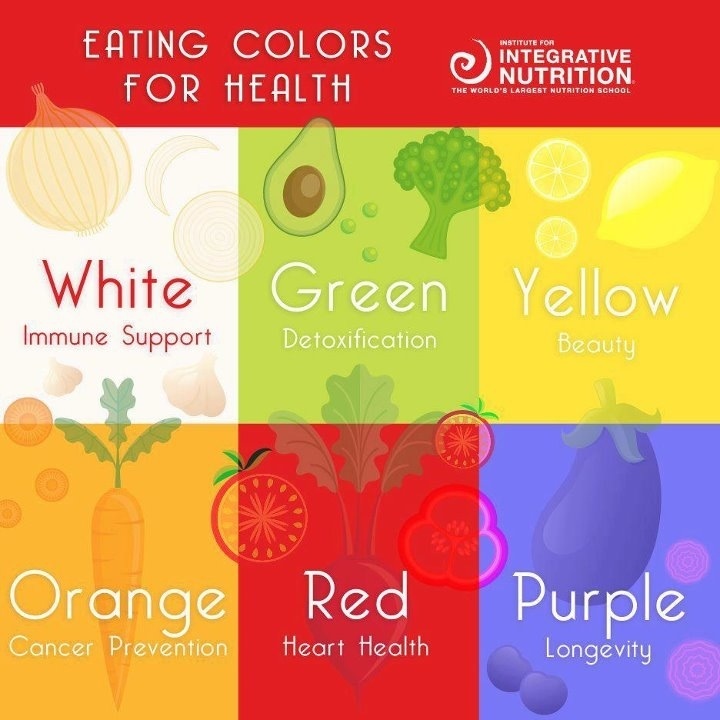 Along with thirst, urine color may be a good indicator you need more water. If your pee is amber colored, you get thy water glass to thine lips! Alcoholic, sugary, and caffeinated beverages dehydrate you, which is another reason water is best. Hydration is Key to a Healthy Complexion! Have a glass of water in the morning after waking up. Why? Drinking water will help us keep hydrated. After sleeping for several hours, your body hasn’t received any intake of water. 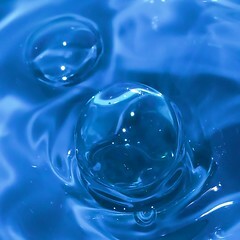 Water is essential for good health and drinking water first thing in the morning will help jump start your day. These days images of an overly-altered Heidi Montag or Britney Spears with her unfortunate extensions are scary reminders of the drastic (and not always pretty) lengths celebrities will go to achieve their own and society’s ideals of beauty. This has been going on for decades in Hollywood, even the most stunning of actresses from the ’30s, ’40s and ’50s were implementing their own bizarro beauty techniques to hide personal insecurities. UPDATE: A previous version of this post stated incorrectly that Marilyn Monroe grew hair on her face due to a side-effect from a hormonal cream. 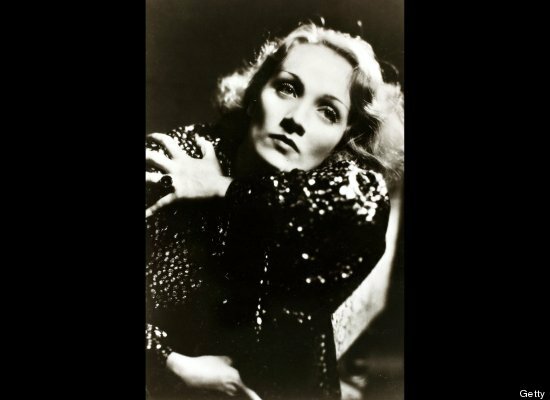 Marlene Dietrich: She was rumored to have had her molars removed to give her cheekbones a more pronounced look. The German-born actress also had hairstylists pull her hair back tightly with hair pins and surgical tape, so her face would have a more taut, “face lift” effect. 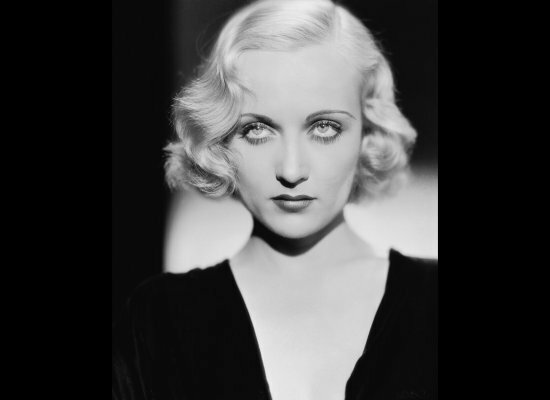 Carole Lombard: The wife of Clark Gable was so self-conscious of a crook in her nose that she drew a thin white line down it before she applied makeup, she believed this created the illusion of a straight nose. 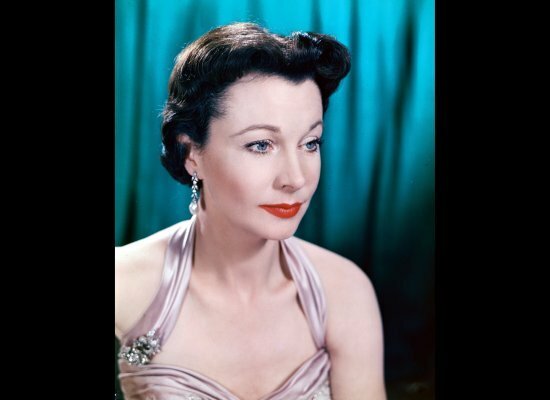 Vivien Leigh: The British actress had a thin lower lip, which she penciled over her natural lipline and filled in with lipstick. 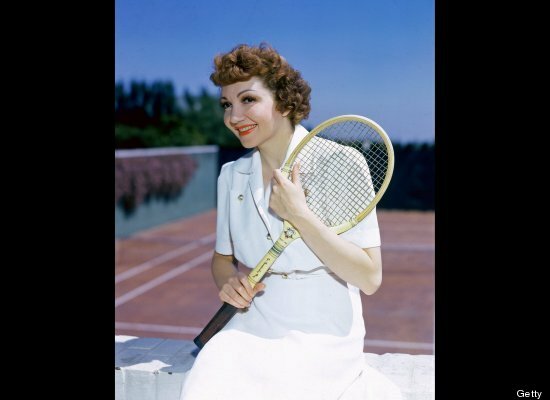 Claudette Colbert: The French-born actress was so embarrassed by her uneven face, she refused to ever be shot by the right side. Sounds like Mariah Carey took a page out of Colbert’s book. 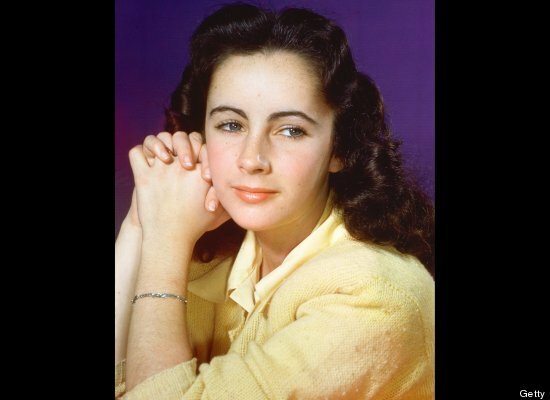 Elizabeth Taylor: She was born with hypertrichosis, an excessive body hair condition. She was covered with dark hair all over her body, including her ears and nose. Though it eventually fell off, the actress was known to shave her face to create a smooth, hairless effect. Rita Hayworth: The flame-haired actress, who was actually born with black hair, had her hairline raised a full inch with electrolysis. Also, her hair grew so quickly that she had to dye it every three days to conceal her dark roots. Marilyn Monroe: In an effort to get glowy skin and remove unwanted peach fuzz, Monroe was known to shave her face. As the Seasons Change Get a Facial! People ask me all the time when to get or how many facials should they be getting. While ideally I would say get a facial every one to two weeks, not everyone can afford this, to them I say once a month or at the very least once a season (Winter, Spring, Summer, and Fall). Like the seasons skin changes. It can be drier due to the cold air, indoor heating, or lack of moisture in the air. It can be oilier and have sun damage due to heat, sun exposure, and excess moisture in the air. By having a facial at least once a season you can fix the damage caused to your skin from the previous season and prepare your skin for the next season. I’m Taking Water the Challenge! I’m challenging myself to drink the proper amount of water a day. Your Skin is made up of 70% water. It is reflected in your skin the amount of water you drink. Too little and skin can look dry, flaky, and dull. When you drink the right amount your skin has more moisture, better texture, and gives your skin a healthy glow. Take the challenge! 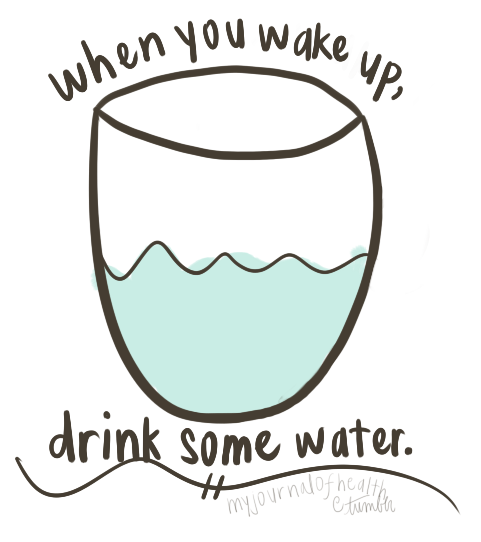 Drink more water! I know you want to pick, but don’t! Please, please, please don’t pick at your breakouts! I know you have heard this from everyone, but I will say it again! DON’T PICK AT YOUR BREAKOUTS! You can cause scarring, spread the bacteria causing more breakouts, and permanently damage the pore. This being said even if you are good and go to a professional such as an esthetician or dermatologist, which is what you should do, you will probably give into temptation and pick at your breakouts at least every once and a while. Never pick at or squeeze a whitehead or blackhead if your face or hands are dirty! Wash your face and hands, no exceptions! After washing your face, take a clean hand towel and soak it in water and heat in the microwave for a few seconds to get it nice and hot. Make sure to test the towel on your wrist first to make sure it isn’t too hot. Put the cloth on your face making sure to leave your nose exposed so you can breath. Leave the towel on for at least a minute to soften the skin and open the pores. Apply toner to your skin that is appropriate for your skin type with a cotton ball or pad. Do your extractions in a well lit room with a wall mirror so both hands are free! You use your fingers, cotton swabs with the with the wooden sticks or a metal extractor (for the extractor tips, see blue). Never use you fingers for extractions unless they are wrapped in cotton, gauze, or tissue. This is important, you don’t want your nails to cut and scratch your skin! Use your pointer finger on your right and left hands. 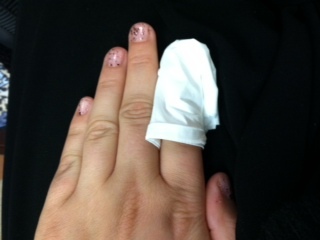 Once your fingers are wrapped spray or dip your wrapped fingers in toner or water so that the wrapping is slightly damp. The same applies if you use a swab. Never use the tips of your fingers, you will end up using too much pressure, use the sides of your fingers instead. Your pores on your forehead, jawline, and chin are vertical. When removing blackheads or whiteheads from those areas place your fingers above and below or side to side with gentle even pressure. Your pores on cheeks are at a slight angle upward. When removing whiteheads or blackheads from your cheeks place one finger above and on below. Gently in a rolling motion slightly raise the skin with your lower finger and roll it up toward your top finger. Always use gentle pressure. 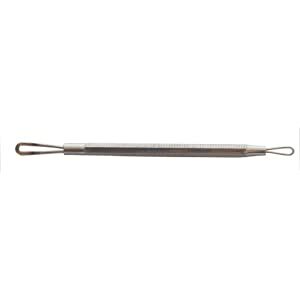 To much pressure can cause broken capillaries and damage the dermis, this is especially true if use the metal extractor. Still having a problem removing a breakout slightly shimmy your fingers as your apply pressure to your skin. If you haven’t removed all your breakouts in 10 minutes stop. Give your skin a break, extraction are hard on the skin don’t overdo it. You can always do more extractions the next day. If using the metal extractor, which can be great for hard to get to places like ears, make sure to sanitize it with alcohol or hydrogen peroxide before and after you use it every time! Don’t share your extractor with anyone it isn’t sanitary. Gently place the loop of the extractor around the breakout, so that it encircles it. Start with the flat edged loop first if it doesn’t remove the breakout try the rounded edged loop. Make sure the loop is placed flat on the skin and with gentle even pressure slowly move the extractor across the skin until the extractor is just touching the edge of the break out, then remove the extractor from the face. After extractions follow up by applying toner to the face. If you have a breakout that needs the skin to broken in order to remove the breakout, leave it alone for a few days! If it still hasn’t come to the surface see a professional don’t go digging in your face with a sharp object to remove it! THIS WILL CAUSE DAMAGE TO THE SKIN! What do you consider makeup etiquette to be?